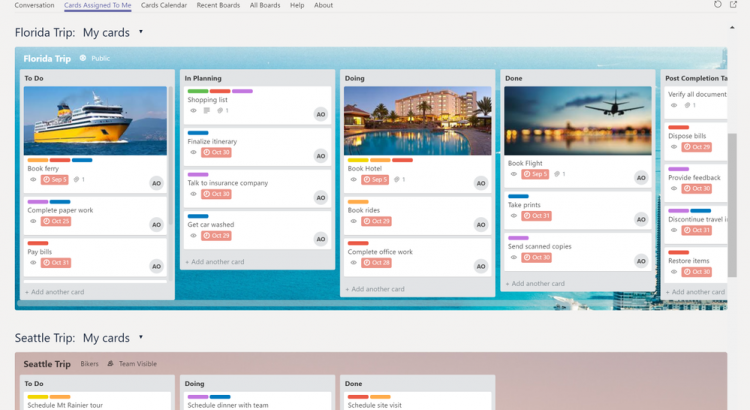 As you may know, we’ve had Trello available for Microsoft Teams for some time. We are excited to announce that this integration has just been enhanced, with the availability of Trello’s personal app functionality. 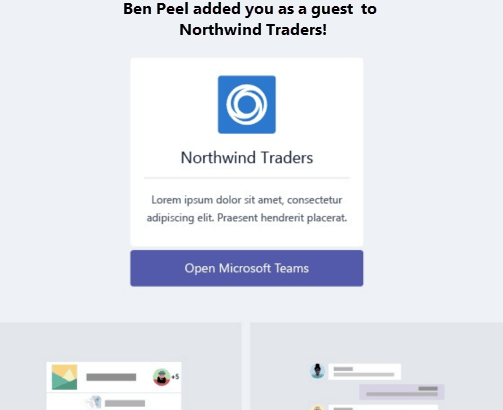 Trello’s Personal app in Microsoft Teams will gives users access to assigned cards across all their Trello boards for different teams where they are contributing. In July, we announced Microsoft 365, which brings together Office 365, Windows 10, and Enterprise Mobility + Security, delivering a complete, intelligent, and secure solution to empower employees. It represents a fundamental shift in how we design, build, and bring our products to market to address customer needs for a modern workplace. Starting October 1, 2017, we are bringing Microsoft 365 to several new audiences. Microsoft 365 Education—A new offer that combines capabilities across Office 365 for Education, Windows 10, Enterprise Mobility + Security, and Minecraft: Education Edition, to provide students, faculty, and staff everything they need to create and work together securely in the classroom. 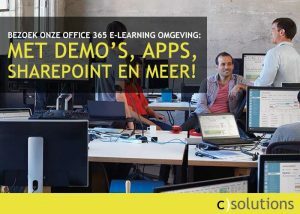 Microsoft 365 Education is offered in two plans—Microsoft 365 A3 and Microsoft 365 A5. In addition, we’re excited to announce a new Microsoft 365 plan for non-profit organizations. 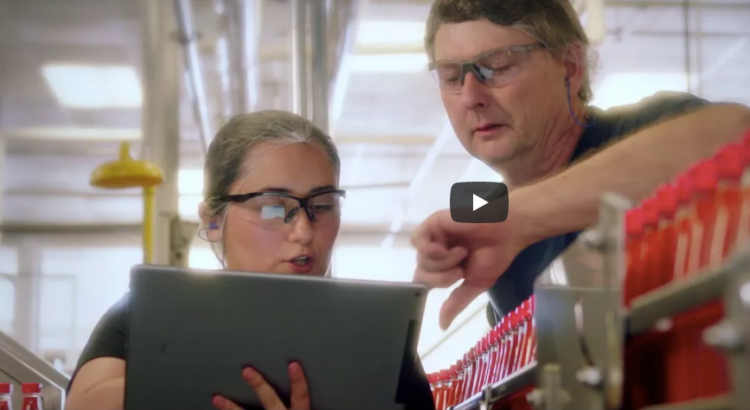 Microsoft 365 F1—A new Microsoft 365 Enterprise plan designed to maximize the impact of the Firstline Worker. Numbering two billion worldwide, these are the individuals behind the counter, on the phone, in the clinics, on the shop floor, and in the field who form the backbone of many of the world’s largest industries. This new plan helps foster culture and community, train and upskill employees, digitize business processes, and deliver real-time expertise while minimizing risk and cost. We’re also adding new product capabilities to StaffHub and Windows 10 to keep everyone connected, automate device deployment, and manage single purpose devices. We also recognize the importance of providing Firstline Workers with streamlined and secure devices that reduce total cost of ownership. Today, we’re announcing new commercial devices with Windows 10 S from our OEM partners HP, Lenovo, and Acer, with availability starting later this year. Starting as low as $275 (ERP), these devices benefit from cloud-based identity and management and are ideal for firstline environments. Work today has quickly shifted from simple execution of routine tasks to creative problem solving. Microsoft 365 provides the tools people need to express their ideas effectively, build on the work and expertise of others, and create compelling content. New intelligent capabilities in Excel—We’re harnessing the power of AI to make Excel more powerful. Coming in early 2018, Excel will understand new data types, beyond text and numbers, and augment that data based on public and enterprise information. For example, Excel will know that “India” is a country and “MSFT” is a stock. Insights—a new service coming to Office Insiders this year—also uses AI to find and recommend patterns, helping you derive additional insights from complex data. Intelligent, personalized search—New search capabilities enable you to discover people and information from across your organization and beyond. We’ve made improvements to help you quickly find the content and expertise you need across SharePoint and Office.com, and you can even search for people and content directly from your Windows taskbar. Bing for business, now in private preview, brings internal sites and content into Bing search results to help you find the right information and resources. Wherever you start your search—you get consistent, personalized results powered by the Microsoft Graph. LinkedIn profile integration—Today, we’re announcing the ability to view LinkedIn profiles in Microsoft apps and services. This new experience, rolling out now to first release customers, provides rich insights about the people you’re working with—inside and outside your organization—right from within Office 365. See LinkedIn profile information from Microsoft apps and services. One of the hallmarks of the modern workplace is the shift from individual productivity to dynamic teamwork. Microsoft 365 addresses the complete set of needs you have across your organization by providing a universal toolkit for teamwork with a broad set of purpose-built apps, all on a secure platform. 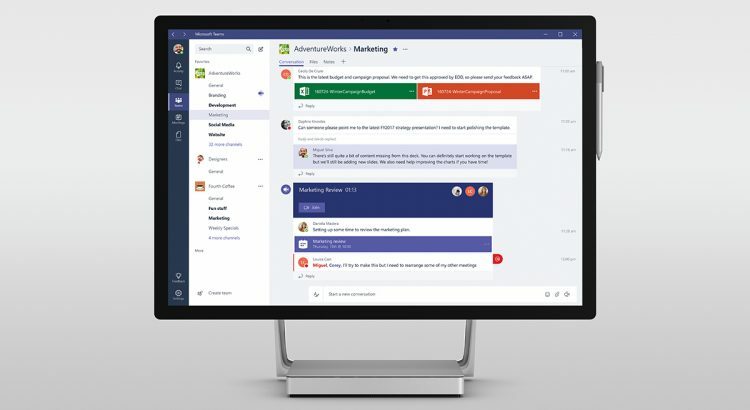 Intelligent communications with Microsoft Teams—Today, we’re announcing a new vision for intelligent communications to transform calling and meeting experiences by bringing comprehensive voice and video capabilities into Teams, along with cognitive and data services, and insights from the Microsoft Graph. 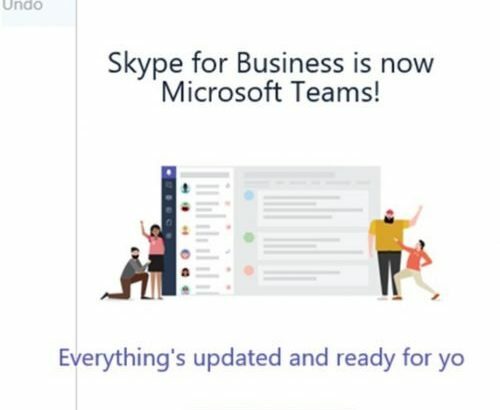 As a result, Teams will evolve as the primary client for intelligent communications in Office 365, replacing the current Skype for Business client over time. Enhanced content sharing with OneDrive and SharePoint—The new unified sharing experience, now in Windows, Mac, web, and mobile, will come to the Office apps in the coming weeks. The new experience provides a simple, consistent, and secure way to share and control access to files across Office 365. And you can now securely share files with people outside your organization who don’t have a Microsoft account. In addition, you can customize the look and layout of SharePoint pages, add dynamic content from over 100 new web parts and connectors, as well as share those pages on SharePoint sites or as a tab in Teams. Cross-org connections with Yammer—We continue to invest in Yammer as the best way to connect with people across your organization. Today, we’re announcing deeper integration with SharePoint, new group insights for community managers, and enterprise-grade compliance with local data residency. Yammer group insights show trends for group members and non-members. In the modern workplace, the role of IT has never been more important. Microsoft 365 is designed to meet business needs and minimize total cost of ownership across the IT lifecycle, from deployment to management and ongoing servicing. Only Microsoft delivers a complete solution for your entire productivity infrastructure. Simplifying management—Beginning in early 2018, Lenovo, HP, Panasonic, Fujitsu, and Toshiba will join Surface in supporting Windows Autopilot on new Windows 10 devices, automating new device deployment and configuration. This fall, we’ll also introduce new capabilities in Microsoft Intune to manage Windows 10 devices with Office 365 ProPlus, configure Windows Defender Advanced Threat Protection, and deploy Win32 apps. New migration capabilities—To help customers on their transition to the cloud, this fall, we’ll introduce co-management, a new set of capabilities to help customers migrate to cloud-based management of Windows 10 devices with Microsoft Intune. We’re also announcing FastTrack for Microsoft 365, which provides planning, guidance, and assistance to help IT professionals drive adoption and usage across Microsoft 365. New proactive insights—Office 365 Usage Analytics, generally available in early 2018, will enable IT professionals to analyze and visualize service-wide usage data in Power BI. On the desktop, we’re updating Windows Analytics this fall with new update compliance and device health capabilities to help proactively identify and address new issues that may impact user experience and productivity. The new usage analytics dashboard uses Power BI to unlock rich insights about service adoption. As employees embrace a new culture of work across devices and cloud apps, their interactions can become more difficult to secure. Updates to Microsoft 365 provide broad security capabilities, powered by Microsoft’s Intelligent Security Graph, to help protect people and sensitive data from new, sophisticated threats, and to help you meet compliance obligations. Expanding conditional access—To help you better secure the “front door” of your organization, we’re expanding conditional access capabilities. To secure sessions inside SaaS apps and protect sensitive documents, we are integrating across Azure Active Directory, Microsoft Cloud App Security, and Azure Information Protection as well as extending multi-factor authentication to include third-party support. The Microsoft Cloud App Security dashboard. Information protection—Microsoft 365 helps you detect, classify, protect, and monitor your data, regardless of where it is stored or shared. Today, we’re announcing the integration of Azure Information Protection with Office 365 Message Encryption, which makes it easier to send protected emails and documents to recipients using consumer email services such as Outlook.com and Gmail. Phishing protection and automatic remediation—Today, we’re unveiling new threat protection capabilities built on the Microsoft Intelligent Security Graph. New Office 365 Advanced Threat Protection features help mitigate content phishing, domain spoofing, and impersonation. We’re also announcing a limited preview of Azure Advanced Threat Protection to help detect attacks on user identity sooner, and the integration of our recent Hexadite acquisition into Windows Defender Advanced Threat Protection to automatically help investigate, assess, and remediate threats. Compliance Manager—We’re also announcing the upcoming preview of Compliance Manager, a tool to help organizations meet compliance obligations like the EU’s General Data Protection Regulation (GDPR). It performs a real-time risk assessment with a score that reflects your compliance position against data protection regulations when using Microsoft Cloud services, along with recommended actions and step-by-step guidance. Use the Planning Workshop for Microsoft Teams presentation to have an interactive conversation with attendees about getting started with Microsoft Teams. 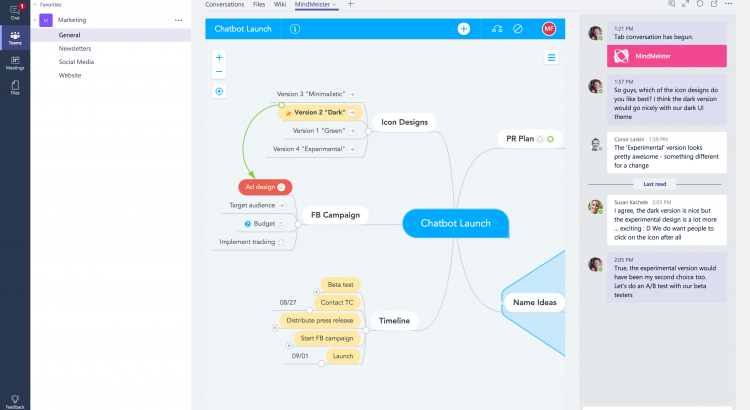 Now You Can Mind Map in Microsoft Teams, Using MindMeister! 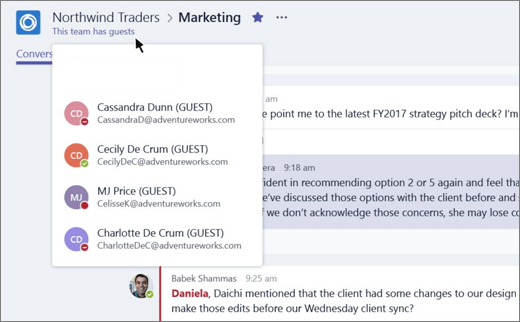 Guest access in Microsoft Teams allows teams in your organization to collaborate with people outside your organization by granting them access to teams and channels. A guest is someone who isn’t an employee, student, or member of your organization. They don’t have a school or work account with your organization. For example, guests may include partners, vendors, suppliers, or consultants. 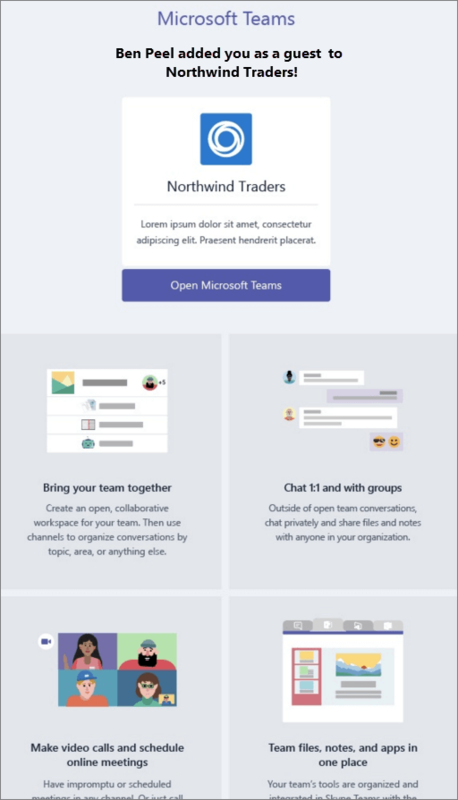 Organizations using Microsoft Teams can provide external access to teams, documents in channels, resources, chats, and applications to their partners, while maintaining complete control over their own corporate data. Microsoft Teams is built upon Office 365 Groups and provides a new way to access shared assets for an Office 365 group. 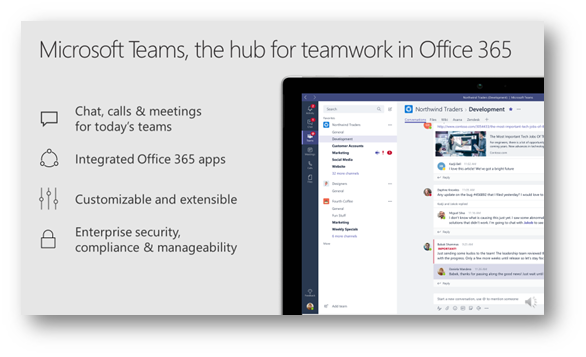 Microsoft Teams is the best solution for persistent chat among group/team members. 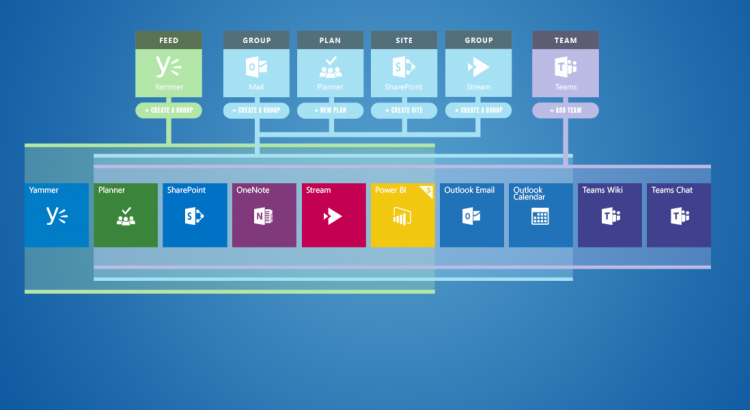 Office 365 Groups is a service that provides cross-application membership for a set of shared team assets, like a SharePoint site or a Power BI dashboard, so that the team can collaborate effectively and securely. A team owner in Microsoft Teams can add and manage guests in their teams via the web or desktop. Guests can have any email address, and the email account can be a work, personal, or school account. Step 1 A team owner or an Office 365 admin adds a guest to a team. Step 2 The Office 365 admin or the team owner can manage a guest’s capabilities as necessary. For example, allowing a guest to add or delete channels or disabling access to files. Step 3 The guest receives a welcome email from the team owner, inviting them to join the team. After accepting the invitation, the guest can participate in teams and channels, receive and respond to channel messages, access files in channels, and participate in chat. While using Microsoft Teams, a combination of text and icons gives all team members clear indication of guest participation in a team. For more details, see What the guest experience is like. When a guest is invited to join a team, they receive a welcome email message that includes some information about the team and what to expect now that they’re a member. The guest must redeem the invitation in the email message before they can access the team and its channels. All team members see a message in the channel thread announcing that the team owner has added a guest and providing the guest’s name. Everyone on the team can identify easily who is a guest. As shown in the following screenshot of a sample team, a banner indicates “This team has guests” and a “GUEST” label appears next to each guest’s name. 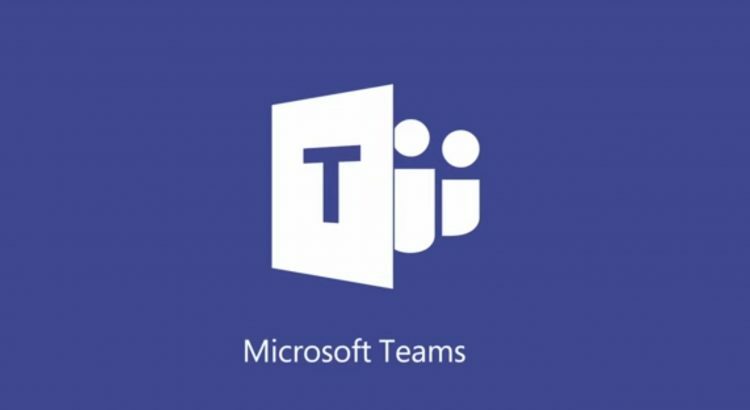 The following table compares the Microsoft Teams functionality available for an organization’s team members to the functionality available for a guest user on the team. Team owners control this setting. NOTE: Office 365 admins control the features available to guests.